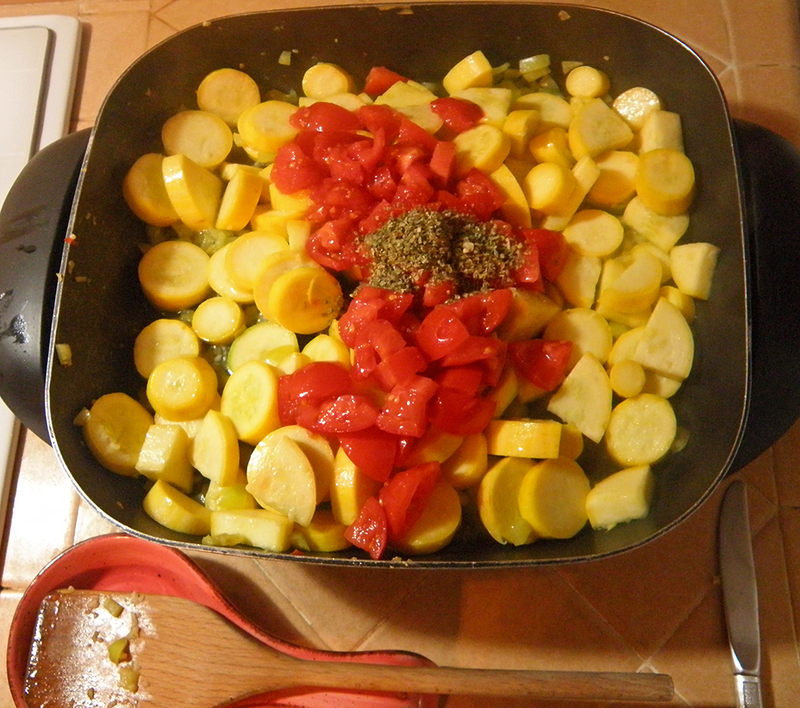 If someone told me that I could eat only two vegetables for the rest of my life and let me make the choice, I’d choose yellow squash and tomatoes. When I was a teenager, my mother and I would eat all-vegetable dinners straight from the garden on hot summer evenings. These always included sliced fresh tomatoes and steamed and mashed crookneck squash with butter, garlic salt, and pepper. These meals inspired me to take up organic gardening a few years later. I must have mentioned that squash was my favorite to my neighbor Dana a few years back, because she started dropping off enormous amounts of summer squash from her garden at our doorstep. Since I was raising up a boatload of tomatoes myself, this recipe evolved naturally. You can use any type of summer squash or combination of squashes including pattypan and zucchini in this recipe. Dana also supplied the Hungarian yellow wax peppers, a uniquely flavorful and semi-hot pepper that gets hotter as the season progresses and peppers get bigger. This recipe is only slightly spicy with seeds removed, but if you like it hotter, add as many seeds as you dare. You could substitute another semi-hot pepper, like padrones, or even experiment with a few jalapenos or other hot variety. My husband taught me the trick of wearing snug-fitting latex gloves when seeding and chopping hot peppers to avoid getting the “heat” (technically capsaisin) on fingers and anything else they might touch. Wearing gloves is superior to wrapping hands in plastic bags or trying not to touch the peppers much, two methods that I’d improvised previously. The cup equivalents of ingredients are approximately as follows: ½ - ¾ cup chopped peppers, 1 – 1 ¼ cup diced tomatoes, and 6 cups sliced squash. 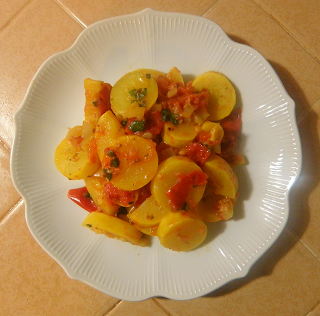 You can vary the proportions in this recipe if you like, as long as there is enough tomato liquid to braise the squash. If you’re short on tomatoes, add some drained and chopped canned tomatoes. If you don’t have veggie broth granules on hand, you can substitute one crumbled-up bouillon cube. You can substitute dry marjoram and oregano if you cut quantities down to 1 tsp. each. Any variety/combination of Italian herbs will work in this dish. Run garlic cloves through garlic press. Dice garden tomatoes into ½ inch chunks. Using latex gloves, remove tops and seeds from Hungarian peppers. Chop them fairly fine. Slice summer squash about 3/8 inch thick, cutting larger pieces in half or quarters so that pieces are about equal in size. Snip up fresh herbs with kitchen shears. Heat a nonstick pan, add olive oil, and cook garlic in oil till fragrant, a minute or less. Add chopped peppers and cook in oil over medium high heat, stirring, for 1 or 2 minutes. Add sliced summer squash. Stir up from bottom to coat squash with oil, garlic, and peppers, cooking about 1 minute. Add wine, salt, and tomatoes and sprinkle with fresh pepper. Stir and cover. Cook over medium heat about 10 minutes total, stirring every 3 minutes, until squash is soft. (If substituting dry herbs for fresh, add when stirring at 6 minutes). 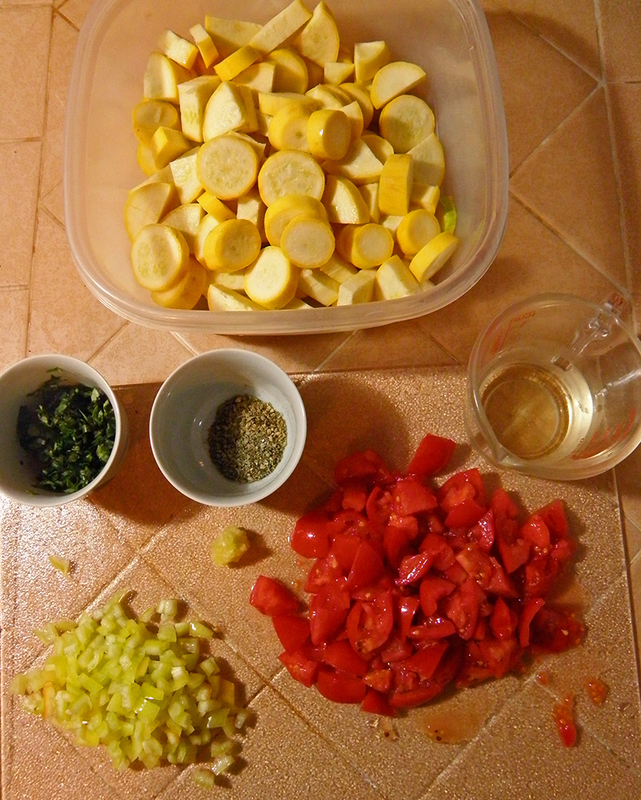 If using fresh herbs, stir in when squash is done, and add salt and pepper to taste.